Today is Monday, April 3, the 93rd day of 2017 in the Gregorian calendar, with 272 days remaining. 1,389 days until the end of Donald Trump's term as President, assuming he isn't impeached. 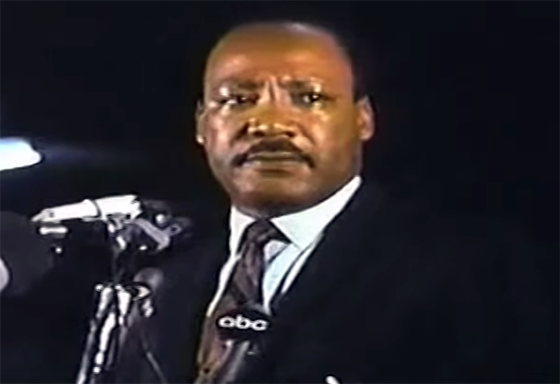 On this date in 1968, Martin Luther King Jr. deliverd his "I've Been to the Mountaintop" speech. The next day, he was assassinated. Among other things, today is also National Chocolate Mousse Day. Florida woman sentenced to prison for allegedly giving toxic tush shots. William 'Boss' Tweed (1823-1878), corrupt American politician. "~Goodall, Jane\Jane Goodall\|I don't have any idea of who or what God is. But I do believe in some great spiritual power. I feel it particularly when I'm out in nature. It's just something that's bigger and stronger than what I am or what anybody is. I feel it. And it's enough for me." Tiny fish with a funny name could help with opioid crisis. The fang blenny's venom could provide a safer alternative to addictive drugs responsible for so many deaths. Study finds 'staggering' rise in mastectomies in these states. "What we didn't expect was that we found the highest proportion in the Midwestern states, Nebraska, Missouri, Iowa, Colorado and South Dakota." Those are the states in which more than 42% of women 20 to 44 who underwent surgery between 2010 and 2012 opted to remove both breasts with a contralateral prophylactic mastectomy (CPM), a procedure to remove the healthy breast along with the affected breast. SpaceX to launch "silliest thing we can imagine" on debut Falcon Heavy. To save funds, the company plans to employ two used Falcon 9 cores as side boosters. Mylan announces nationwide EpiPen recall over potential defect. According to the company, some of the devices may have a defective part that does not allow for the activation of the injector in case of allergic reaction. The Republican majority in Congress is an illusion. The recriminations following the GOP’s health-care failure obscure a simple reality: The party doesn't have as much power as its leaders thought it did. Ivanka Trump and Jared Kushner still benefiting from business empire, filings show. They remain the beneficiaries of a sprawling real estate and investment business still worth as much as $741 million, despite their new government responsibilities, according to ethics filings released by the White House Friday night.